I really like my big metal colander - but it does take up a lot of storage space. 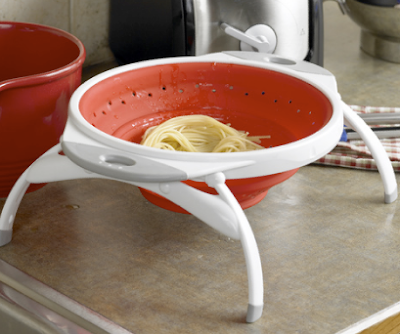 If you need to save space, perhaps the Rösle collapsible colander would work well. It's available in red, green, purple and black - in two sizes. 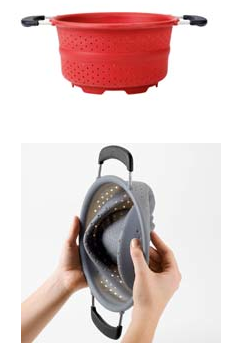 If you'd prefer another style, take a look at the collapsible colander from Dexas, which sells products under its own brand and also as private labels. 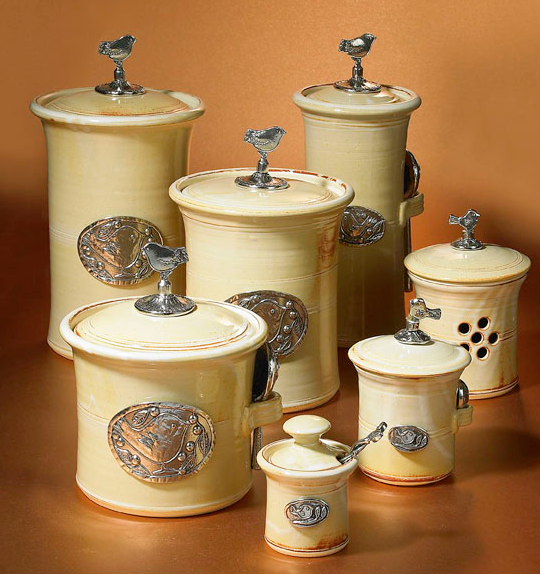 You'll see very similar products at Sur La Table, at Macy's (as part of the Martha Stewart collection), and as part of the Chef'n SleekStor collection. Update on August 1, 2014: I'm no longer finding this at Sur La Table or Macy's. 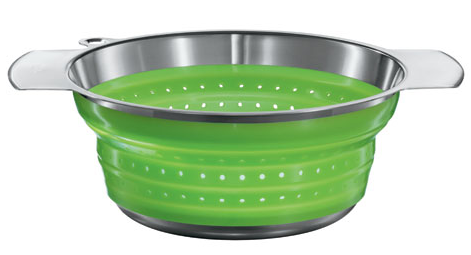 And there are even more colander options! This one comes from Oxo. 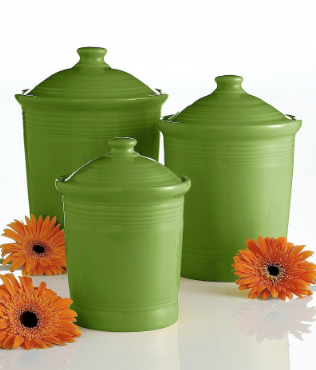 Norpro has some "knockdown" colanders, too - three different styles. Update on Aug. 1, 2014: Norpri has a different product now — a steamer/strainer. 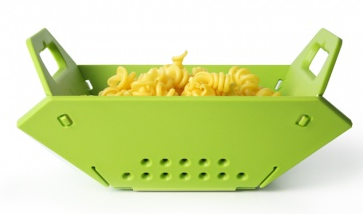 And Joseph Joseph takes a different approach with its folding colander. 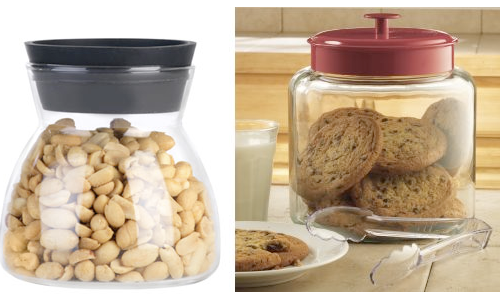 Another item that takes up a lot of space is a salad spinner. 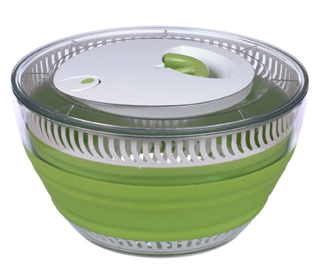 If that's your storage challenge, look at the collapsible salad spinner from Progressive Intl. How Do I Store the Strainer? Flat! How Much TV Time is Right for You? Me? I don't own a TV, but that doesn't mean I don't watch any. I catch some of Jon Stewart, The Colbert Report, and Hoarders - but on my computer. 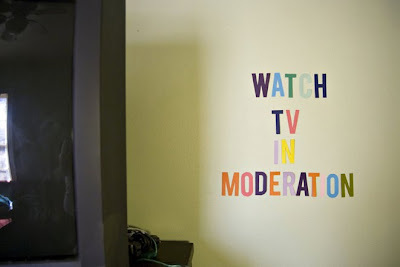 I just don't watch enough TV to make it worthwhile to pay for cable (without cable, I get no reception) and to make room for a TV somewhere in my home. And I'd also need a DVD recorder or Tivo or some such - more money, more space issues. But that's what's right for me, at this point in my life. As Ta-Nehisi Coates wrote: "Owning a television didn't work for my family. I would never suggest that it's not working for your family." Make a TV-watching plan. Sit down with the viewing guide and pick out the shows you want to watch that week. Watch only those shows, and when they’re over, turn the TV off. Throw out the remote control. It’s impressive how much less television you’ll watch if you have to get up every time you want to change channels or adjust the volume. First image from Erin at Recovering Lazyholic; it's one of her Reminder series. Used with permission. Found via Swiss Miss. 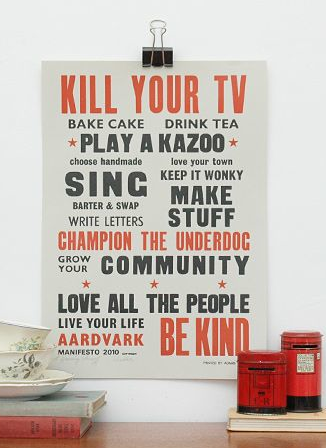 Aardvark Manifesto from Keep Calm Gallery; available for purchase. Clay Shirky article via Seth Godin and Lifehacker. Ririan post via Lifehacker and Dumb Little Man. 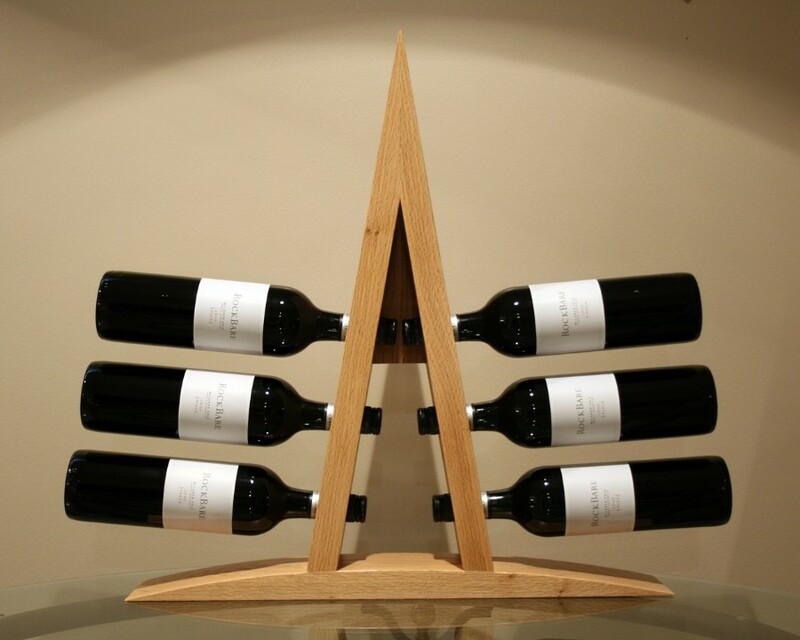 Want a stunning table-top wine rack? This one by Anthony David Oliver shows "sold out" on his Etsy store, but at least one other site says it's in stock. Update on Aug. 11, 2012: It doesn't seem that Oliver has an Etsy store any more, and I'm not seeing any site selling this. 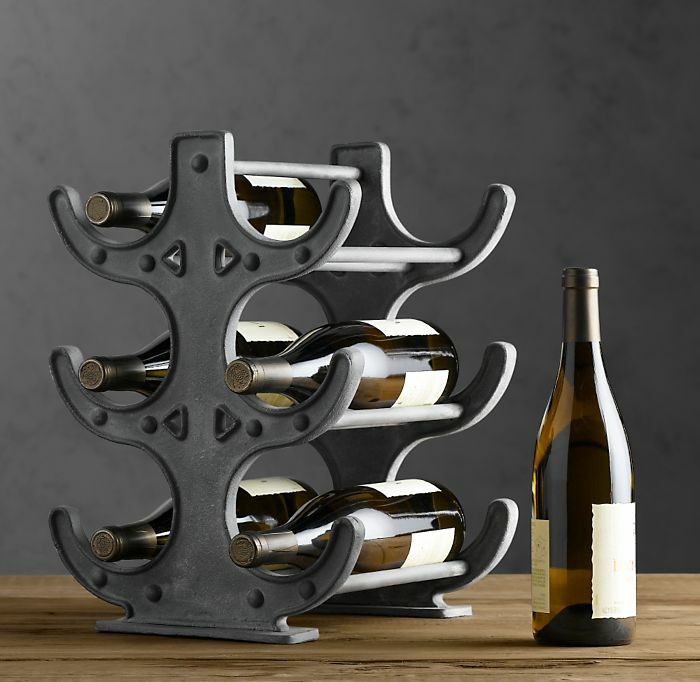 But maybe you're not looking to spend $250 for a rack that holds six bottles. Here's a less-expensive option from Restoration Hardware - with a very different look. [via Uncrate] Update on Aug. 11, 2012: Restoration Hardware no longer sells this wine rack. 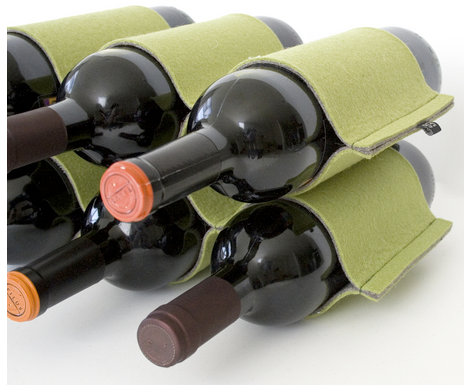 Or you could get a 6-bottle felt wine rack from Etcetera Media. This green-grey color combination is sold out, but there are other dual-color options. A single-color version is also available. [via Swiss Miss] Update on March 3, 2011: Etcetera Media has closed up shop. 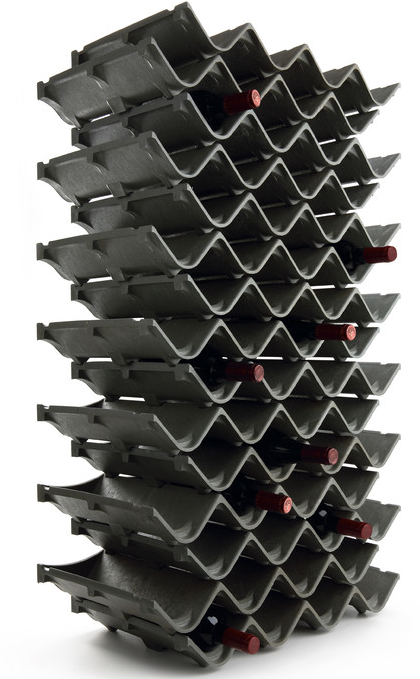 This rack is one of the Bali series from Oenophilia, available in various sizes and colors. You can find these all over the place: Target, etc. 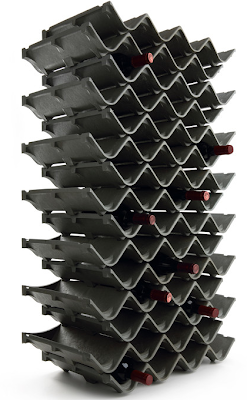 And here's a stacking wine rack, from Zack - something a bit different from other stacking racks I've seen. [via From Europe] Update on Aug. 11, 2012: I'm no longer finding this product. Returning to gorgeous wood-working, here's the Vin-O Wine Rack by SIDD - not inexpensive, but a work of art. 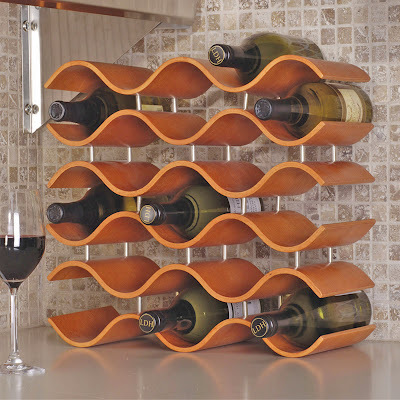 [via Furniture Fashion] Update on Aug. 11, 2012: I'm no longer finding this wine rack. And let's end with something really special: a custom under-stairs wine cabinet. 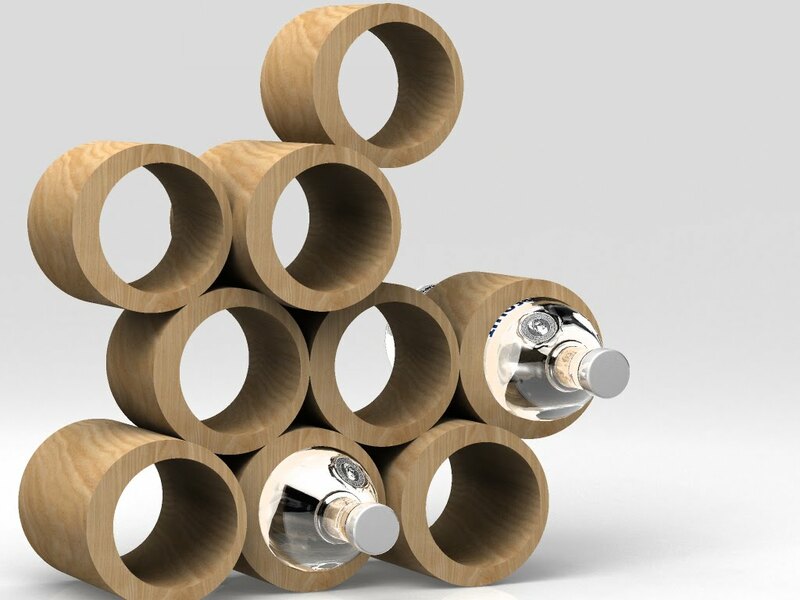 This is just one of the many options from Vinotemp. My May 2010 newsletter is now available. See that light fixture? It's the one I had in my home office until this morning. 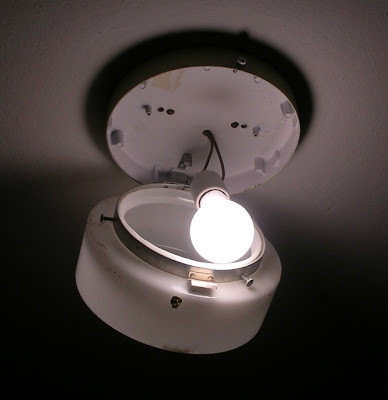 Unfortunately, at some point it became next to impossible to get the screws to line up, so the cover often hung down, leaving the exposed bulb - as you can see. This did not exactly create the ambiance I wanted in my office. 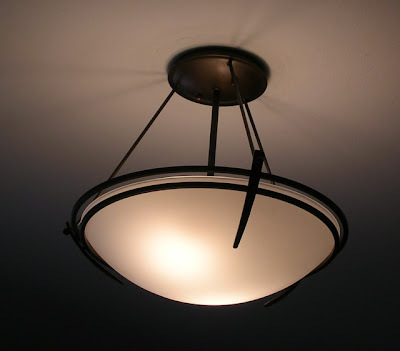 See this new light fixture? I bought it a few days ago. My wonderful handyman installed it this morning. It's much prettier, and it provides better light. My office feels good again. How long did "replace office light fixture" sit on my to-do list? Let's not talk about that. And it wasn't as though this was a difficult task. I knew exactly what store I wanted to buy the fixture from, and I knew who to call for installation. The store isn't in town, but it's only a 35-minute drive away. But whatever it was that had me procrastinating about some minor home projects, I seem to be crossing them off my list quite rapidly now. The garage door that didn't go down when I clicked the remote - except in rainy weather, for some unknown reason - now has a new opener mechanism that works just fine. No more getting out of the car and walking into the garage to close the darn door. And I've got an appointment for this weekend to drop off the household hazardous waste items (cleaning products, yard care products, etc.) that currently reside in my garage. 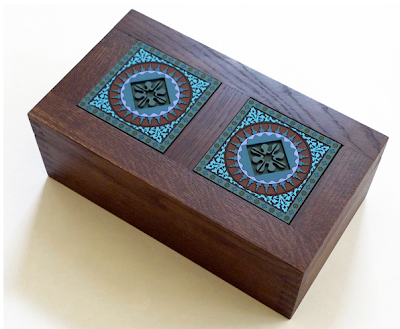 Now I have some momentum, and I want to get all my lingering mini-projects done. Any time now I might actually get a couple nice nightstands, sell a few things on craigslist, and finish my document scanning project. What a difference it made once I decided to really focus on getting these projects done, one step at a time! And how much better things are for having gotten them done! We've looked at bread boxes before - but not anything quite like the ones I'd like to show you today! 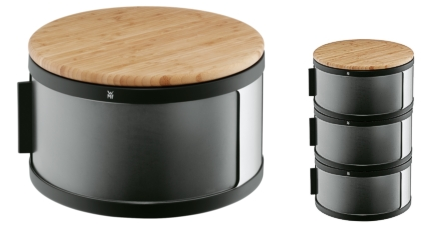 Let's start with the stacking bread bins (or bread drums) from WMF; these could be a nice space-saver. Have a spare drawer in your kitchen? This next one is hard to see - but Custom Inserts will change a drawer into a bread box. Bastide educated me about the panetière: "A panetière or breadbin is a wooden piece of furniture dedicated to the storage of the bread." 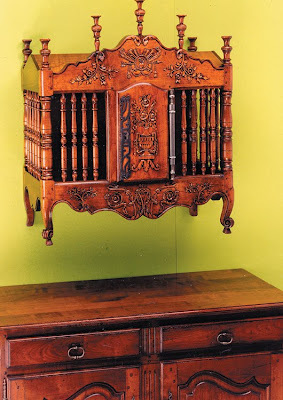 Bastide also explains that in the 19th century, in Provence, you got some very elaborate wall-hung designs. 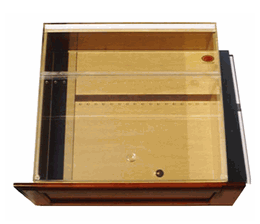 If you'd like a reproduction panetière, head on over to Eric Marjolet. 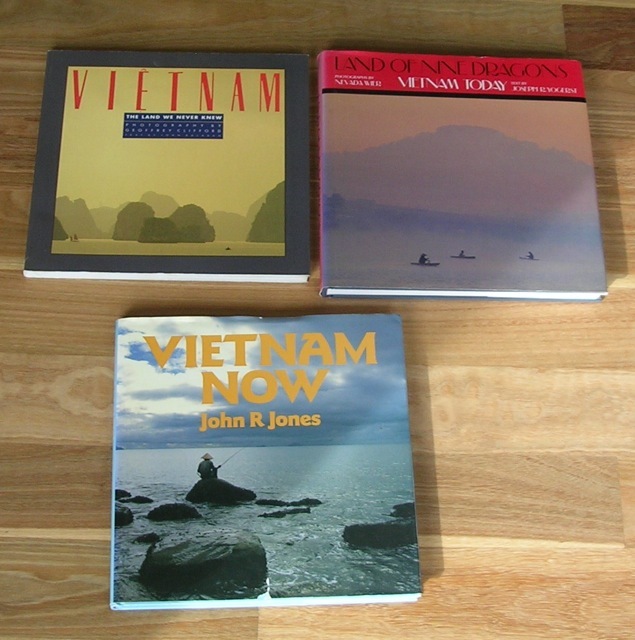 Eight issues of Cook's Illustrated magazine. A big bag of craft supplies: beads, buttons, pipe cleaners, etc. I've met some wonderful people through Freecycle, too! 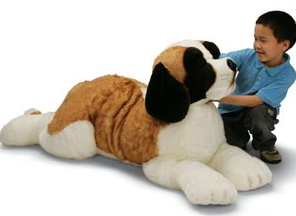 OFFER: Very large stuffed St Bernard plush toy. This darling dog is almost 5 ft from foot to tail. Brown and white. Very soft. Sits on the floor in a reclining position. Took two years of negotiation to get this out of my daughter's room. If you want purely practical canisters, you could get the glass canisters from The Container Store that are square, stackable - and have airtight lids. 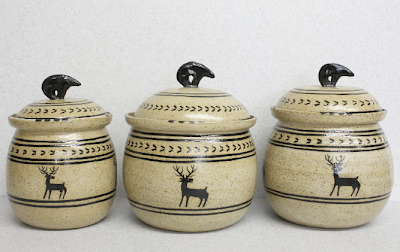 But if you'd like something more whimsical, you could get these canisters (or one of the other choices) from Crosby & Taylor. 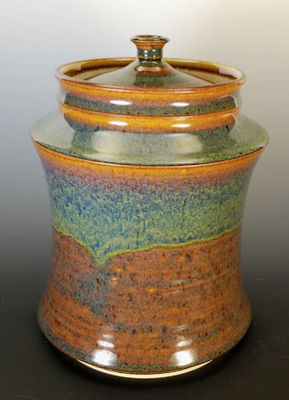 For another style of stoneware, you could get a "lidded jar o many uses" - such as this canister - from Promethean Pottery. Like polka dots? These Spode canisters are on sale at Macy's. (And you can also get them here.) 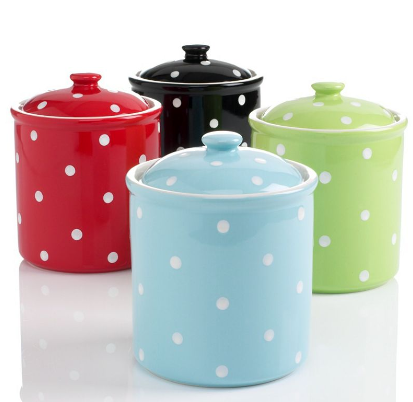 Kitchen Craft also has polka dot canisters. 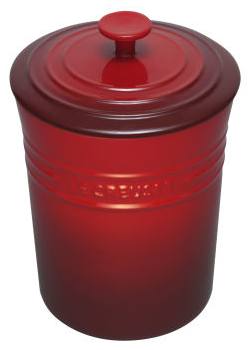 And Le Creuset has canisters in three sizes; you can get them here (among other places). 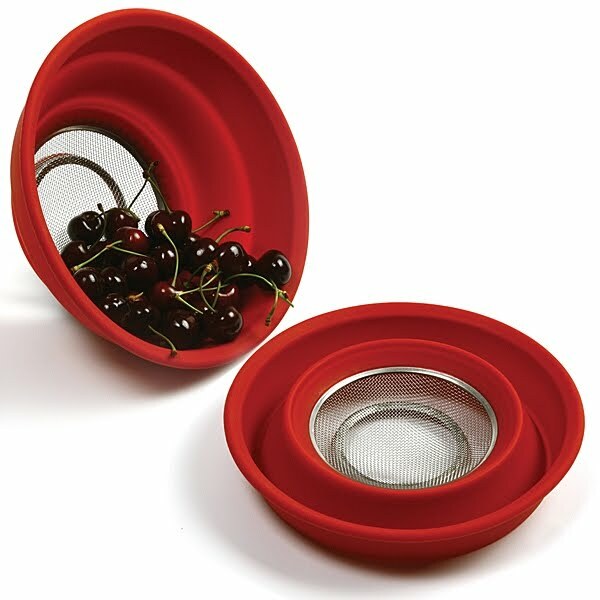 Actually, there are a number of kitchenware brands I didn't know had canisters, including Fiesta (available here and here, among others). 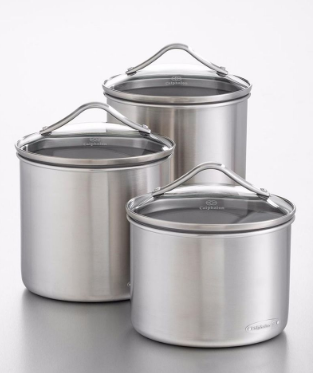 And then there's Calphalon, available here (and other places). 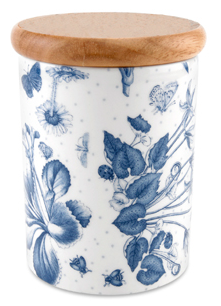 If I'd seen this storage jar from Portmeirion - one of the company's many canisters - a few days ago, it would have made it into my "blue" collection. 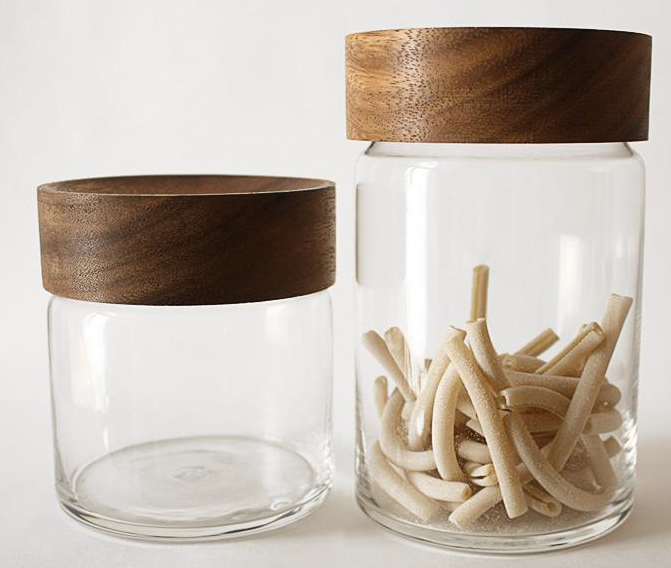 Would you like glass canisters with a bit of style? Here are some to consider! 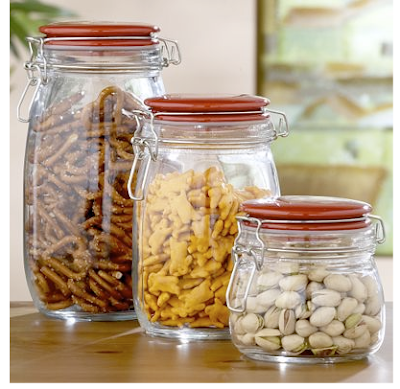 Anchor Hocking - which makes square, stackable canisters - also has a number of other options. And even Cost Plus World Market has a nice option! 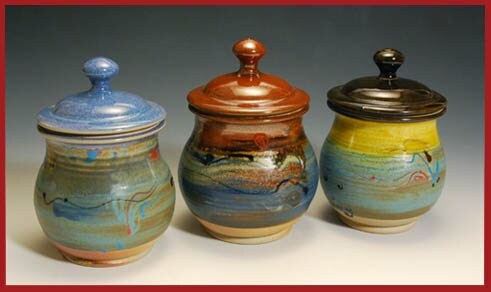 But getting back to the unusual, take a look at these canisters from Old Farmhouse Pottery in Texas. 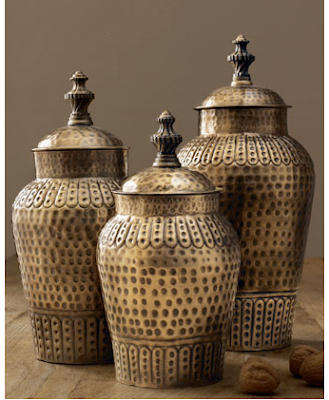 Finally, here are some hammered brass canisters. 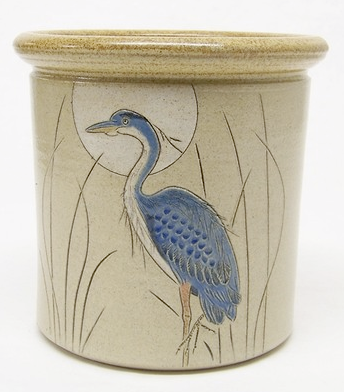 And just for giggles, you can go over to Flickr and see one of the canisters I used to own, many years ago. What a surprise it was to see this pattern again! Update on May 20, 2010: Full disclosure: After this post ran, the folks at Crosby & Taylor sent me a petite salt pot (and some flavored sugars) as a thank-you gift. This was not something I was expecting - so it obviously had nothing to do with what I posted. 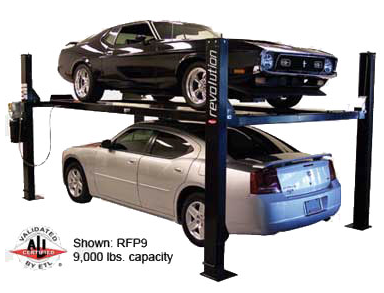 Reading John Trosko's garage-related post today reminded me that it's about time for me to write another garage post! 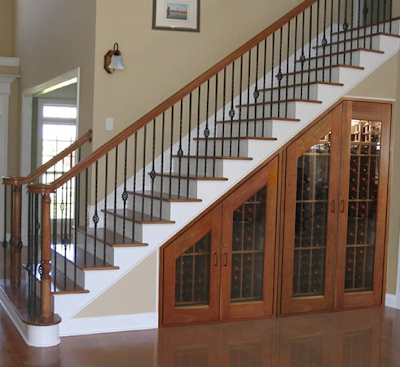 While there are many multi-purpose garage cabinets, slat board systems and such, I thought I'd focus on some of the specialty products I've been seeing. Let's start with the EnviroStacker, sold by Lee Valley Tools. While it was designed to let you get those old recycling bins off the floor, this bracket can be used with many bins that have a rigid lip. 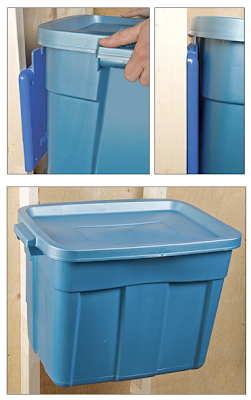 [via Toolmonger] Update on March 27, 2012: These are now called Bin Brackets. 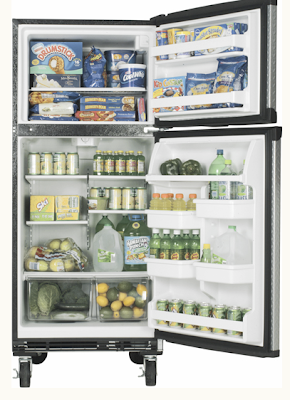 Want a spare refrigerator in your garage? 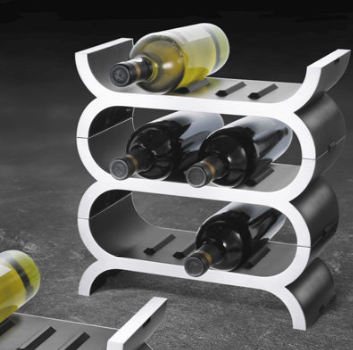 Gladiator has a refrigerator designed just for garages. As the Gladiator web site says: "Unlike your neighbor's garage refrigerator that they retired from their kitchen, the Energy Star qualified Chillerator Garage Refrigerator is not only designed to handle the extreme temperature and humidity of the garage environment, it also saves you money by reducing energy consumption." 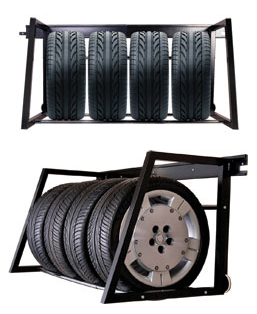 Here's a storage rack designed specifically for tire storage - helpful if you live in a climate where you change tires as the seasons change, or have any other reason to be storing tires. 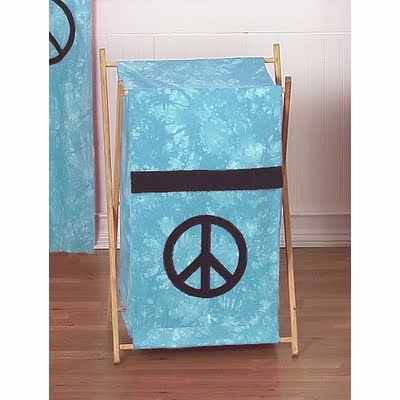 On this third anniversary of my mom's death, I thought I would once again remember her with a post featuring blue organizing products - blue being her favorite color. This year, I'll start out with a utensil holder that isn't entirely blue, but certainly makes great use of the color. It comes from Jim and Gina at Hummingbird Studio Pottery. I've written about them before - but it's time for a reprise! 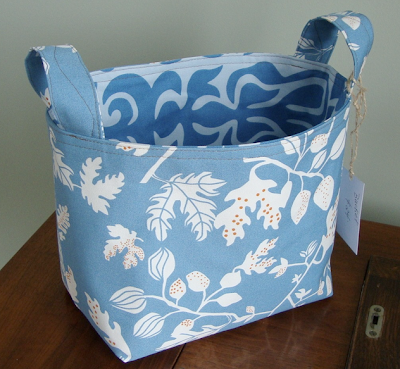 This nice fabric bucket comes from ShaggyBaggy. 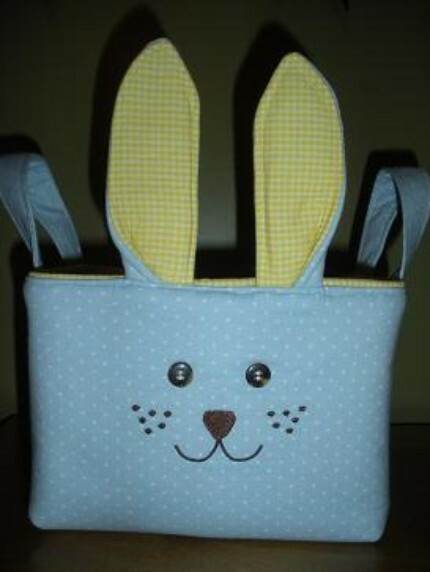 This bunny basket from Aunt Jeannie's Attic should probably have been included in my alternative Easter basket post. But it's not so Easter-specific that I can't include it here! 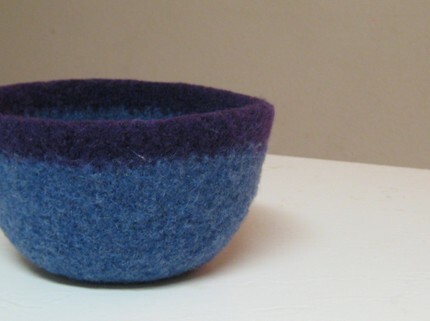 Here's a lovely felted bowl from Bowenism. 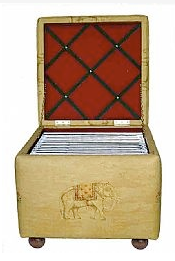 Images d'Orient is the source for this tea box; the company has points of sale in 22 different countries. I've include the laundry hampers from JoJo Designs in another post, but I just had to include this hamper, anyway. 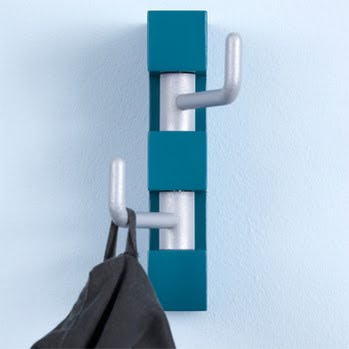 Searching for blue items led me to all sort of products I might not otherwise have found, including the very neat Quasimodo coat hooks from de Nord. 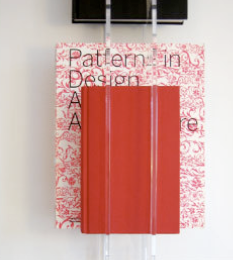 They come with either two, three or five hooks; eight color options are available. Update on Feb. 17, 2014: I'm no longer finding the blue version of this hook, and I'm finding very few in any size or color. However, you can still get the white two-hook version at Artic Design. 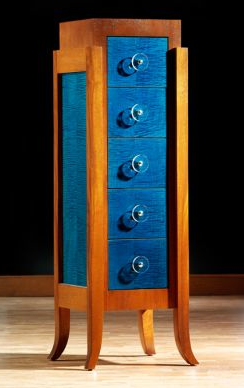 And finally, there's this stunning dresser from John Strauss Furniture Design. Peter Walsh has been publicizing his new line of products from OfficeMax; the You - Organized desk collection includes an ottoman designed to hold hanging files. But you can't buy the ottoman separately - and you can't get the ottoman from this OfficeMax office-in-a-box separately, either. Update on July 1, 2013: I'm not currently finding either of these products at OfficeMax. Fortunately, there are other file ottomans available! Here are some that really caught my eye. As I've mentioned before, Ballard Designs has a file storage ottoman (shown above) with over 135 fabric options: solid colors, florals, stripes and more. 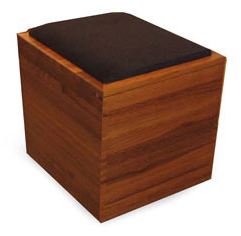 Here's a gorgeous option - a teak ottoman with file storage. Go over to the U.K., and you'll find more options. 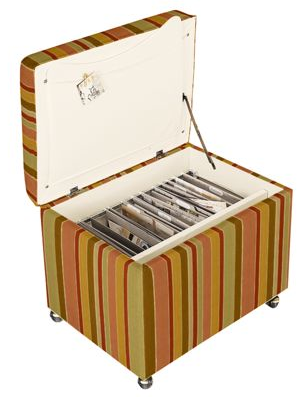 This filing ottoman by Sue Bensassi is covered in an Andrew Martin fabric. Update on July 1, 2013: I'm no longer finding this ottoman. 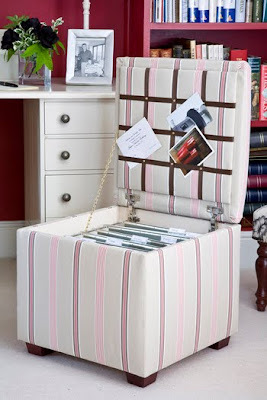 The Dormy House has this lovely filing ottoman. You can select from The Dormy House collection of fabrics, or provide your own. 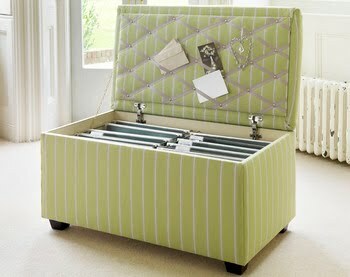 And finally, The Dormy House has a large filing ottoman, too.